We know that health issues don’t operate on a 9-5 schedule. So that’s why we’ve come up with an alternative, giving you real-time access to our physicians whenever you need them. 24 hours a day, 7 days a week, 365 days a year. Studies have consistently shown that the quality of healthcare services delivered via telemedicine are as good those given in traditional in-person consultations. In some specialties, particularly in mental health and ICU care, telemedicine delivers a superior product, with greater outcomes and patient satisfaction. That’s why we’ve simplified the process to help you and your family get healthy again. It all starts with a simple phone call to put you in touch with a board certified, licensed physician. From start to finish, it generally takes just 30 minutes to get resolution. And with access anytime you need us – 24 hours a day, 7 days a week, 365 days a year – you’re always connected to a solution. A benefit for your health and your wallet. Reducing or containing the cost of healthcare is one of the most important reasons for funding and adopting telehealth technologies. iSelectMD has been shown to reduce the cost of healthcare and increase efficiency through better management of chronic diseases, shared health professional staffing, reduced travel times, and fewer or shorter hospital stays. For just the cost of a cup of coffee from Starbuck’s, you can make use of a monthly membership to our service. And should you need to consult one of our doctors, you can be in touch in less than an hour. No hidden fees. No surprise bills. This is healthcare that never requires you to read between the lines. For over 40 years, telemedicine has been used to bring healthcare services to patients in distant locations. Not only does telemedicine improve access to patients but it also allows physicians and health facilities to expand their reach, beyond their own offices. Given the provider shortages throughout the world–in both rural and urban areas–telemedicine has a unique capacity to increase service to millions of new patients. With iSelectMD, you have access to superior medical care whenever you need it. By simply going to our mobile health portal you can get in touch with our exceptional staff of doctors. On average, it takes just 12 minutes for a physician to return your call and 30 minutes to get resolution. It doesn’t get much simpler than that. Consumers want telemedicine and love the simplicity of iSelectMD. 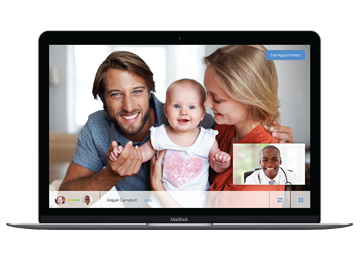 The greatest impact of telemedicine is on the patient, their family and their community. Using iSelectMD reduces travel time and related stresses for you and your family. Over the past 15 years study after study has documented patient satisfaction and support for telemedical services. iSelectMD offer patients the access to providers that might not be available otherwise, as well as medical services without the need to travel long distances. Get signed up below today and Get Well Soon!